On 1st December 2009, we launched a community consultation on the future of Bute’s energyproduction. Feasibility studies undertaking by AECOM and On Site Generation supported by Changeworks were published that set out what the possible mix could be. Thank you to all who took part in the process by completing feedback surveys online and at locations around island, attending our Meet the Consultants meetings, and recording their views on video. Our youngest participant was 7 and our oldest was 71! 94% are in favour of Bute becoming 100% renewable! 92% would have large scale wind turbines on Bute! 77% believe communities should take ownership of renewable energy generation! Our biggest concerns are Climate Change and Rising Costs. The benefits we hope for are Carbon Footprint Reduction, Local Employment, Reduced Energy Costs and Energy Efficiency Improvements. We would spend any income generated on Insulation Projects, Low Carbon Transport and other community projects. Based on feasibility studies, if 14 SME’s & community groups, and RSL implemented the recommendations and the community achieved a 10MW wind project then 17,610.6 tonnes CO2 would be saved, representing around 36.37% of the islands carbon footprint. What do Bute residents say about climate change? 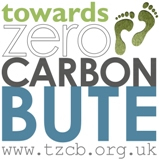 In autumn 2009 Towards Zero Carbon Bute undertook a survey amongst households, farms and businesses. The following is a snapshot of the some of the results. If you want more detailed information then please get in touch with us. We are happy to share the top level data. 73% of households agreed that climate change is particularly important in an island community such as Bute. The results of the survey were presented to Bute residents at a presentation in the cinema on the 17th of January 2010. View the results HERE (pdf opens in new window).